America’s Boating Club Houston offers this 1-day first aid, CPR and AED course. The course is taught through the Emergency Care & Safety Institute (ECSI). The minimum age for taking the course is 12 years old with proper adult or guardian supervision. The course will take between 4 – 6 hours depending on the number of students. There will be a break for a lunch when needed. You can either bring your lunch or go to a restaurant in the area. The course will be taught at Home Port and, if requested, at other areas in the Greater Houston metroplex. Certificates of completion will be issued to those completing the course. The training is good for 2 years. This course will meet all requirements of USCG EMCASI-202 Standard First Aid, CPR and AED as documented in “Course Approvals - Deputy Commandant for Operations – USCG”, and the letter of authorization from the USCG (copy available upon request) dated April 19, 2018. ECSI training courses are offered in association with the American Academy of Orthopaedic Surgeons (AAOS) and the American College of Emergency Physicians (ACEP), two of the most renowned medical organizations in the world. These organizations provide medical direction to the Emergency Care & Safety Institute and stand behind the content of our training materials and the operation of our organization. 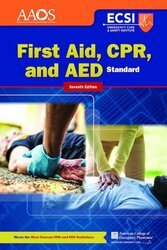 Any applicant who has successfully completed your Emergency Care and Safety Institute (ESCI) CPR (EMCASI-133): We have determined that the following Emergency Care and Safety Institute (ECSI) CPR course will meet or exceed the standards of the American Red Cross or American Heart Association CPR courses and will satisfy the training requirements of 46 CFR 11.201(e)(2)(iv) for a merchant mariner license: This determination is effective June 1, 2018, and expires on June 30, 2023. Any applicant who has successfully completed your Emergency Care and Safety Institute (ESCI) First Aid (Various Courses) (EMCASI-202): We have determined that the following Emergency Care and Safety Institute (ECSI) First Aid (Various Courses) course will meet or exceed the standards of the American Red Cross or American Heart Association First Aid, CPR and AED courses and will satisfy the training requirements of 46 CFR 11.201(i)(1) (ii) for First Aid and 11.201(i)(2)(iii) for CPR for a merchant mariner license: This determination is effective June 1, 2018, and expires on June 30, 2023. Tuition must be paid during class registration via our online system. Books should be purchased during registration. We can accept walk-ins on a limited basis. The book is not required for the course. It is recommended that one book per family be purchased. Books are not available for sale at the course (pre-purchase only) and will be delivered at the time of the course. Request a First Aid/CPR/AED class be scheduled!